In 1957 a group of Tibetan monks were informed that a highway was being built that would go right through their shrine. The shrine, a huge clay Buddha, had to be moved. They hired a moving crew and when moving day came, they lifted the statue with a crane and as they lifted the enormous shrine, it started to crack. The monks were frantic and had them lower it back down. When they examined the Buddha the monks and engineers found several large cracks. They would need a larger crane but one was not available until the next day and there was a storm brewing. The monks covered the Buddha with a waterproof tarp for the night and all seemed well. During the night the head monk came to check on the Buddha. With a flashlight he carefully inspected the condition of the Buddha. While he walked around it he shone his flashlight into the cracks and something caught his eye. What he saw did not make sense and he needed to get a better look. So he gathered a chisel and a hammer and when he widened the crack, he couldn’t believe his eyes. He ran to get the other monks and they spent the entire night chiseling away the clay. After many hours they stood back to take in the sight. 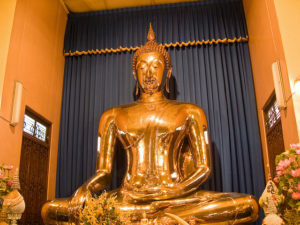 There in front of them stood a solid gold Buddha that had been hidden for over 700 years! Within us all is a solid gold version of ourselves that we cover up with layer after layer of clay. In childhood when we are told we are too loud, or too sensitive or too fat, we throw on some clay. When we feel hurt by not being good enough or smart enough or strong enough, we throw on some clay. When our hearts hurt from broken relationships or unkind words from others, we throw on some clay. When the world feels too big and we don’t feel apart of it or we feel no one understands, we throw on some clay. Little by little we cover up that beautiful and pure gold essence that is who we really are. It can get really thick, I know. But then one day we stumble and fall, or we lose our job, or we lose a patient or we decide to leave the relationship and a crack develops. We focus on the crack thinking it is a sign of weakness but if we can stay with ourselves and not judge but instead just be with what is, another crack will develop. It takes a lot to stay with ourselves during challenging times, I know. It takes courage to stay connected to ourselves rather than disconnect through substances, distractions, busyness or technology But if we do, if we refrain from self-judgment and negative thinking and instead lean toward self-compassion, we will get a glimpse into that crack and see the light reflecting out. When you can lean in instead of away, the clay will start to fall off and what will be left is that perfect expression of you. The one you knew so many years ago but let others opinion’s take precedence over your own. My friend, it is time to reclaim your brilliance. There is and has never been, anything wrong with you. Your time to shine is now. The layers of clay are cheating the world out of your magnificence. Nothing outside of you has the power to make you feel good or bad. You have the control and it’s all about how you are thinking. Your thoughts create your feelings, not the circumstance. Now go and get your hammer and chisel…you’ve got work to do.